The Chipper Clipper: HOT skinny cow coupons have reset!! The HOT Skinny Cow coupon is available again. 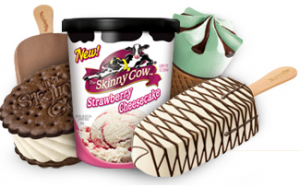 Visit the Skinny Cow website to print a coupon for $1 off any Skinny Cow product and $.50 off any skinny cow cup! The little Skinny Cow ice cream cups go on sale for $1 each often so grab those for free after this coupon. Or Walmart sells them for $1.22 every day.